When you say “travel” it could mean many different forms. However, they all have one thing in common. And there are many types of vehicles to create that movement. Most like to travel but the number of people who suffer from motion sickness is surprisingly large. Those who don’t suffer from motion sickness might think the problem is being exaggerated. But the truth is it is a big problem if you are one of those suffering. Even the famous sea explorer Kaishu was said to have suffered motion sickness. So you can just imagine how many people are plagued with this sickness. For so many, motion sickness is the enemy of the journey that people have been fighting for centuries. The good news is that there are actually many ways to combat motion sickness. Let me tell you about some! First and foremost, the better condition you are in, the less likely you are to suffer from motion sickness. ● An almost full stomach is a good idea. ● Do not drink too much liquor the day before or immediately preceding travel. = Motion sickness can be a lot worse when drunk or hung over. ● Get a good night sleep the day before. = Sleep deprivation has a significant impact on motion sickness! = In particular, where loose -fitting clothing around the stomach and waist. ● Relax and loosen up your body before boarding! = If when riding you feel stiff and fatigued, it will have an adverse effect. Simple stretching and light exercise can have a positive effect. = It is not only the visual experience that is the problem. It is easier to get sick from the sense of smell. It’s a good idea to include your favorite scent of aroma oil in a handkerchief or mask. = Neck pillows sailed as a travel goods store are a good idea. Your mental state will also effect motion sickness. ● Uneasy thoughts like “I may get sick,” or “it’s easy to get sick are not good. ● Listen to music in order to relax. it may even help you in falling asleep. 4. What you should or shouldn’t do on a plane, train or automobile. We will introduce what you should and should not do at the time of boarding. ● Sit in the direction you are traveling, see as much of the view as possible. Although all seats on a plane face the direction of travel, this is not the case on trains. Many trains have seating where groups of 4 passengers sit facing each other. Be sure to choose the side facing the direction of travel. ● Avoid putting sour things in your mouth as much as possible. It is not often that we have fresh lemon in the car, but be careful of lemon candy or juice that may affect you. Just looking down will make some people feel sick. It is even more dangerous looking down and following the fast movement of a mobile game. Do not close your eyes. It is better to stare blankly into the distance. Be aware of your riding position! The Largest cause of motion sickness is “shaking” caused by the vibration and acceleration of the vehicle. This is because the semicircular canals” in the back of the ear that controls the sense of balance is likely to be affected by the movement of the vehicle. This “swing” is different depending on the position you sit in the vehicle. (Bad) A bad place to sit is just above the front, or rear wheels. Since there is a lot of movement generated from a large tire, it is best to sit away from the tire. Since most of the weight is in the front of the plane, the back tends to move a lot. Over the wing is bad because your lack of a view will contribute to making you sick. (Good) A good place to sit is the back of the boat because this is where most of the weight is. (Bad) A bad place to sit is in the front of the boat and the further you are away from the sea (bottom deck) the worse it will be. ● Lightly bite the around the first joint of the thumb for about 15 seconds. ● There is a point between the thumb and index finger that you can hold that is also good to stop motion sickness. Pressing these spots in advance can work to prevent motion sickness from starting. 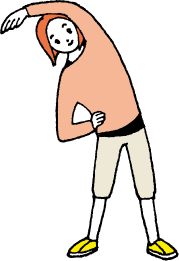 ● If you have mild symptoms change the mood by chatting and stretching. ● Open a window and get some fresh air. ● If you are on a ship get some fresh air out on the deck. ● Look at stationary things such as views of the scenery. ● Keep your head cool and still. 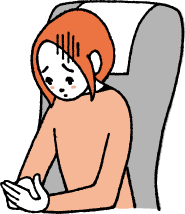 If motion sickness makes you anxious, even hesitant to travel, please try these methods. They can make it so you can enjoy traveling again!